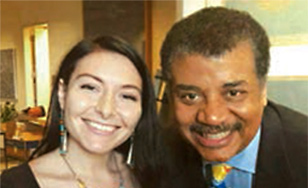 Winonah Ojanen took part in the prestigious National Science Foundation undergraduate research program with leaders in the field of astrophysics, including Dr. Neil deGrasse Tyson. When Winonah Ojanen '18 graduated this spring with a dual degree in Elementary Education and Ojibwe Language, it was only the latest in a series of impressive accomplishments. Ojanen grew up on the Bad River reservation near Ashland, WI, and graduated from the Perpich Arts Center in Golden Valley, MN. A dedicated student, she always had a particular interest in science, and it truly flourished during her time at St. Scholastica. She began to focus on the intersection of astrophysics and Ojibwe language and culture. "I think it is important for the Ojibwe language to live on in the modern world and in my field of science," she said. "We need to find the terminology with emergent speakers to teach advanced sciences in the Ojibwe language." To learn from Native American elders, she traveled to several reservations across North America, and stayed with families to soak up their culture and language. Last summer, she took part in the prestigious National Science Foundation undergraduate research program at New York's Museum of Natural History and worked with leaders in the field of astrophysics, including Dr. Neil deGrasse Tyson. Closer to home, she has found ways to share her passion for science and education with the next generation. She completed her student teaching requirements at Lowell Elementary School this spring. Her work with a first-grade Ojibwe immersion class was particularly rewarding, she said, and affirmed her desire to teach. "I loved working at Lowell. The students, parents, and staff have been excited about my work with the Ojibwe language. I am thrilled to have accepted a teaching job there for the fall with third- or fourth-graders." Ojanen, who is a McNair Scholar, presented at the Council for Undergraduate Research Posters on the Hill event in Washington, D.C. in April. The highly competitive event gives 60 students nationwide the opportunity to showcase their research to members of Congress, meet with their representatives, and learn about advocacy for undergraduate research. This is the fourth year that a St. Scholastica McNair Scholar has been selected for the honor. "I have been so impressed with the quality of Winonah's work," said Assistant Professor of Education Rachel Payne. "Her unique perspectives have enhanced everyone's education, including mine." Ojanen is grateful to Payne, as well as to Dr. Brendan Miller, assistant professor of Physical Science; and Dr. Lynne Raschke, associate professor of Physical Science. "I have appreciated how supportive they have been with me to individualize my majors and preparation in science for grad school," she said. Her long-term plans include teaching for a few years and then earning a master's degree in astrophysics, followed by a Ph.D. in indigenous astronomy. Ultimately she hopes to go back to teaching.